As of August 2015, Grimm’s Spiel & Holz Design is FSC Certified. Together, we all care about sustainable forest management and a responsible use of our natural resources. For years, we have chosen to use wood from sustainable forestry sources, and now we are delighted to announce that we are also certified according to the FSC Standard. Select products are marked on the website and you will find the FSC logo on the packaging. It is important that we go through this certification process to further our commitment to responsible use of our forests and resources. The FSC (Forest Stewardship Council) certification is recommended as an international seal by world environmental organizations such as Greenpeace and WWF to help preserve ecological balance. The organization behind the seal is the Forest Stewardship Council (FSC), an independent, non-governmental, not for profit organization that sets standards for responsible forest management. It was established in 1993 as a result of the „Environment and Development Conference” in Rio de Janeiro. Today, the FSC is represented in over 80 countries with national working groups. What is the FSC Seal? The seal confirms that the wood for wooden products does not come from exploitative production. To obtain the seal, companies worldwide are evaluated and awarded accordingly. The FSC seal is not only for toys, but a seal which signifies sustainability. The FSC seal is awarded for wooden toys only if specific evaluation criteria of the FSC are met. By purchasing FSC certified products, we can contribute to the protection of our forests for future generations. 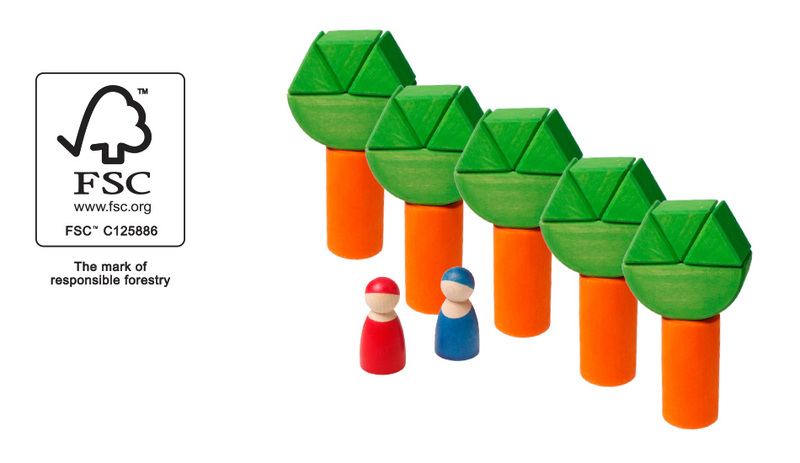 Products made with wood from FSC forests are marked with the ‘checkmate-and-tree’ logo.